The NHS Natural Health School is celebrating a national award after one of the School’s complementary therapists won Tutor of the Year at a national ceremony. The award was presented to Gwyn Featonby at the 2018 Federation of Holistic Therapists (FHT) Conference, held at The King’s Fund, London, on 29 November. Organised by the FHT, the Excellence Awards aim to bring much deserved recognition to high-calibre practitioners, students and tutors working in the fields of complementary, sports and holistic beauty therapy. A qualified nurse, Gwyn has been practicing complementary therapies for over 30 years. Much of her work has been within hospitals and hospices, where she used therapies to help adults and children manage symptoms related to cancer and other long-term or life-threatening conditions. The NHS Natural Health School is dedicated to training the next generation of expert therapists, and is part of a self-sustaining model that provides free treatments to patients at the Sir Robert Ogden Macmillan Cancer Centre, Harrogate District Hospital. Gwyn delivers a unique NHS Certificate in Complementary Therapies – a competency-based programme that provides Level 3 students with the skills and experience necessary to practice in an NHS setting and ensure they meet the needs of patients with complex health needs. 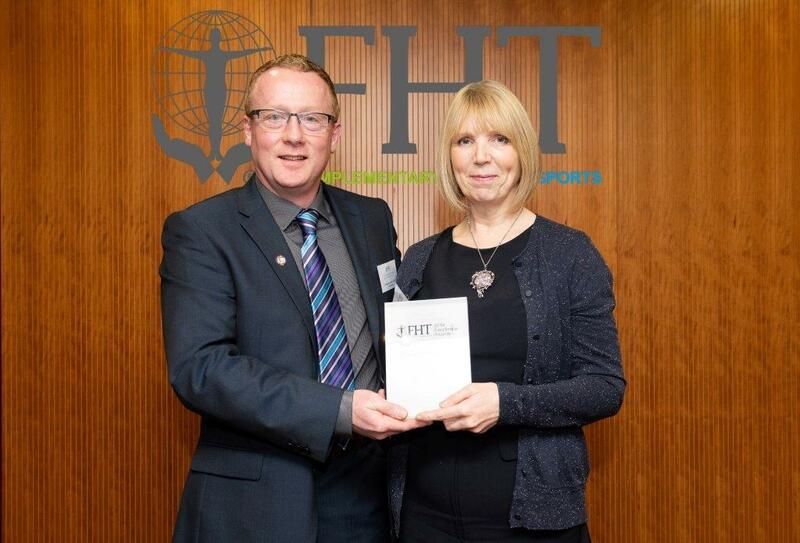 Speaking about her win, Gwyn said: “I am delighted to have won the award for FHT Tutor of the year. It is a privilege to be part of a learner’s journey, whether it’s someone new to the industry, or a practitioner wanting to gain more specialist knowledge. For more information on the NHS Natural Health School, visit www.nhsnaturalhealthschool.co.uk. The NHS Natural Health School is the very first training school in the UK approved by the NHS to offer training in complementary therapies.The School is based at Harrogate District Hospital’s Sir Robert Ogden Macmillan Centre, and provides a range of courses at different grades and for different levels of experience. First launched in 2012, the FHT Excellence Awards aim to highlight the exemplary work being carried out by qualified FHT members. As well as providing examples of what best practice looks like, it was hoped that the case studies behind each award winner would encourage people to ‘think outside the box’ and look at how different complementary, beauty and sports therapies could be used alongside conventional care, to support health and wellbeing. A year later, some education awards were added to the portfolio, as it was clear that lots of tutors and students were helping to raise the bar in therapy training and practice too, and equally deserving of the same recognition.